Sierra Range, June 2012 around 9:00 p.m.
A woman reported that her daughter's boyfriend had a sighting in the region of Shaver Lake. In part she reported: "He saw the Bigfoot in his headlights, crouched down next to the road. As he hit his brakes and came to almost a full stop, the Bigfoot stood up straight, strolled off then ran up the hill and into the trees - he had an unobstructed view for about 5-10 seconds. He is a mountain resident that has hunted bear, and swore unequivocally that it was not a bear or a man in a suit - it was huge, with a huge chest and did not move like a man and that its stride were very long. I believe that he is telling the truth - he's just not a BS kind of guy that would make this up. His Mom reported that he called her, almost hysterical over what he saw." Saturday June 30, 2012: Carla and Manuel M. filed a report that was not a physical sighting. While honeymooning at a rental cabin on Shaver Lake, California they heard vocalizations being emitted from one side of the lake to the other. Manny M. wrote that the sounds were "whoops, --like whoop, whoop, whoop" in a series of three sets that started on one side of the lake and then a return "whoop, whoop, whoop" from the other side of the lake. This went of for several hours after midnight, three nights in a row. Wednesday July 11, 2012 two forestry workers for Southern California Edison, the company that owns Shaver Lake stopped to eat their lunch on the banks of Shaver Lake. As they were getting up to head back to their utility truck (parked on the frontage of Hwy 168) they both stopped cold as a reddish colored Bigfoot walked out of the trees and into the lake. One of the witnesses who filed the report said his visual was too quick to accurately judge its height other than to say it was "a purdy big fella, with a heavy coat of tangled-looking hair all over. " He said it surfaced and swam toward the eastern side in what looked like a very strong dog-paddle kind of stroke; "he was really moving." The two men stood there dumb-founded as the Bigfoot swam out of sight. Additional sighting 2009: The SCE informant in the above report said that when he mentioned the sighting to his daughter's music teacher, she related another story told to her that took place also at Shaver Lake in 2009. In any case, it was a second hand report that told of three campers who were driven out of their tents in the middle of the night by a "screaming-mimi" that unstaked their tents and attempted to drag them off tent and all into the night somewhere. They fled for their lives and did report it to Forestry the next day; it was also reported on the Internet...not sure where. The informant was asked if he knew what the forestry official did, and he said apparently nothing and indicated they were either mistaken or it was a bear. The music teacher had said though, "We know black bears do not behave that way and we have no grizzlies in California." It leaves one to wonder what there is left in the forest that would rip up the tent stakes and heave tents with people inside around the camp site? Bears don't behave that way. Of interest in that story was that the campers kept a high camp fire going at night and that the fire did not deter the attack by the Sasquatches. The music teacher said there was two of them, maybe a third Sasquatch but nobody stuck around to find out. This isn't the first recording of a campsite attack, the other was in Colorado in the San Juan Mountains. But around Shaver Lake and nearby communities, everyone has a story to tell about Bigfoot. Added in February 2013 by Jeff Morris; his track find at Shaver Lake in 1983. 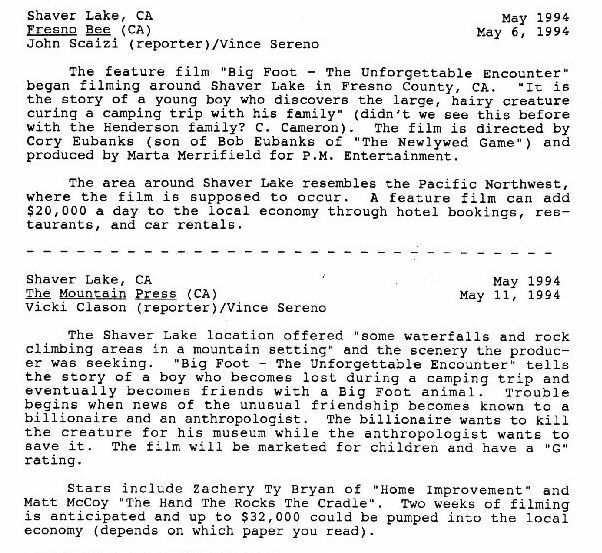 The Cast of "Finding Bigfoot" television series was in Shaver Lake in March of 2012 interviewing witnesses in a town hall meeting event. At that meeting Ken Gentry said his group had a huge rock hurled at them from 300 feet away on the top of a ridge and saw it as it was launched; they were hiking near Three Rivers not far from Shaver Lake area. "It was a very large rock; one of the athletic guys on our crew, Billy picked it up and tried to throw it but he couldn't throw it 25 feet. If I hadn't seen it with my own eyes I would have a hard time believing it actually happened," Gentry said. Southeast of Shaver Lake, is great deer hunting according to Bruce Decova, 51 and his hunting partner Samuel Broderick 46 from out of state. It is an area south of Huntington Lake just short of Dinky Creek off to the eastern rim of Shaver Lake. In late 2009 the two men went looking for a prime place to set up for the hunting season. In the process, Broderick was taking an armload of firewood to the nearby fire pit when he noticed not one but two dark figures in the trees. He continued toward the fire-ring, dumped the firewood and put his hand on Decova’s shoulder whispering to him not to be obvious but to look in that direction when he could...he whispered that they were being watched by what he thought might be a couple of Bigfoot. Decova, a veteran trophy hunter had heard such stories but thought Bigfoot was imagined. He went about setting up their tent and then cleaned off his Rayban sunglasses so he could look around without his eyes giving him away. Sure enough there were two very tall individuals watching them not thirty-five feet from where he was staking the tent. The pounding of the stakes echo’d in the trees but there were no other sounds to be heard; the Bigfoot made no noise. Decova turned at that point and told Broderick that he also could see them and was amazed. To break the tension, Decova yelled over to Broderick, "do they understand English?" Broderick broke into a nervous laughter-like heh heh and began nervously singing the state fight song; Decova joined in as they edged toward the rifles laying on the ground. The behavior of the Shaver Lake/Dinky Creek “Watchers” was decidedly different from most reports from hunters in that the two Sasquatch apparently knew what the rifle meant even though the two hunters did not acknowledge their presence. There are reports of vocalizations in that region and a number of recent sightings of varying color description making Janis conclude there might be a diverse population in that region. Janis also noted in his report that neither Broderick nor Decova bagged a deer that trip; in fact Broderick said he never spotted one and even that was unusual. Mossmanko253 wrote December 28, 2012 that he and his girl friend were riding around looking at property in the Shaver Lake area when they decided to pull over and break out sandwiches at the dead end of Dorabella Road. He looked up as the woman with him cried out "look, look," and saw a very strange sight. Heading back into the far side of the trees was a man in a "furry costume." He didn't report it because he thought it was a joke until he read this page and decided to report it as a "possible BF sighting" that occurred on September 15, 2012. In hindsight, the witness said what he thought was a man in a costume was much too tall to be a joke. "This was about 12:30 on Saturday afternoon, we were parked eating chicken sandwiches and sharing a diet Pepsi when this happened. My lady-friend didn't think it was a costume, but some kind of creature because the furry part was reddish and long fur down its back and not like a hooded costume." If this was a Bigfoot the couple saw, it brings the sighting total around Shaver Lake to 5 in 2012. UPDATE: Hiker Matthew Hansen has been found but no details. Here is a little tidbit I bet you didn't know about Shaver Lake? If you have further information regarding sightings at Shaver Lake, California please email, bobbieshort@yahoo.com and file your report.